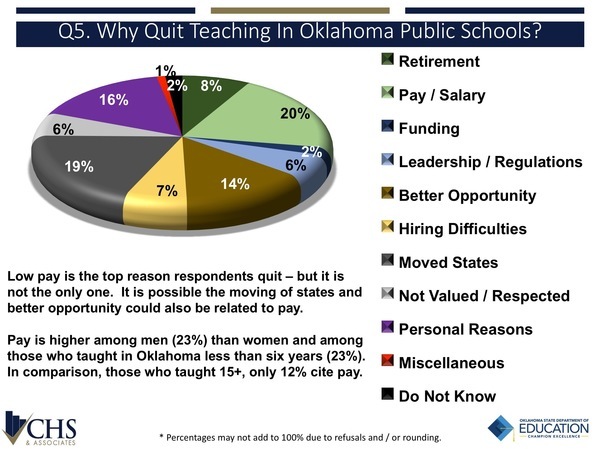 OKLAHOMA CITY (Jan. 22, 2018) – Teacher pay and education funding are among the chief reasons former Oklahoma educators have left the classroom, according to a comprehensive survey released by the Oklahoma State Department of Education (OSDE). State Superintendent of Public Instruction Joy Hofmeister discussed the findings Monday at a news conference at OSDE. Hofmeister noted that 31 percent of the respondents indicated they would likely return to the classroom if teacher pay were increased – a net gain of thousands of additional educators in the classroom if the data were extrapolated. The survey was one of 40 recommendations made by the Teacher Shortage Task Force, a still-active panel that Hofmeister convened in September 2015. The Oklahoma Public School Resource Center (OPSRC), a member of that task force, funded the survey, which Oklahoma City-based polling firm Cole Hargrave Snodgrass & Associates conducted this past fall. The survey was sent to a list of nearly 30,000 deliverable emails. Of that number, there were 7,546 completions. Survey results focused on the 5,487 respondents under the age of 65 with active teaching certificates who are not currently teaching in Oklahoma public schools. The large sample size yielded a margin of error of less than 1 percent. The vast majority of respondents, 90 percent, said they believe other teachers were leaving the classroom because of low pay, with 55 percent strongly agreeing with that statement. In addition, a significant number indicated that being unable to make decisions related to instruction and impediments to practicing the art of teaching were important factors in leaving the classroom. When asked for their individual reasons for leaving, one-third identified pay or a better opportunity as the chief reason. However, a number of other factors cited by respondents – including inadequate education funding, hiring difficulties, relocating out of state and personal reasons – can also be related to matters of teacher compensation. The majority of respondents felt that from their first year in the classroom to their last, the quality of the work environment had deteriorated rather than improved. Nearly half (48 percent) believed it had deteriorated a great deal. When asked to identify why, more pointed to funding issues (17 percent) than low pay (15 percent) though again, the two may overlap. 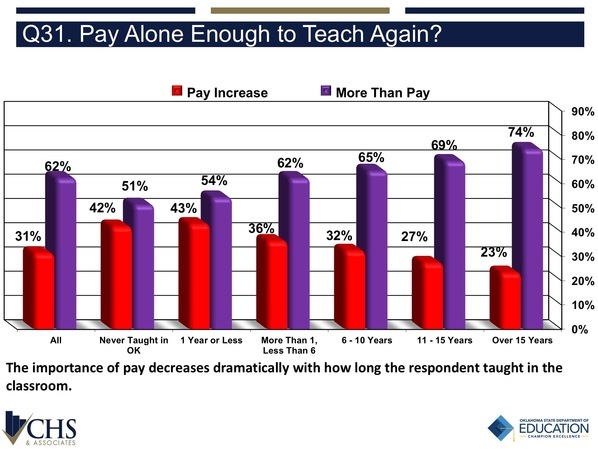 In terms of certification type, the largest percentage of those who said pay was a primary reason for leaving were special education and secondary teachers. Hofmeister said that finding is especially troubling. Of particular interest among the survey results is the strong age line regarding pay sensitivity. 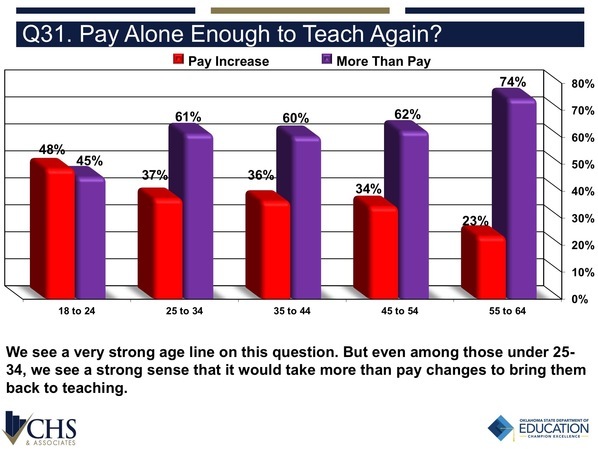 Those under the age of 45 were more concerned about pay than older teachers. Forty-eight percent of respondents 18-24, 37 percent of those 24-34, and 36 percent of those 35-44 said that pay alone would be sufficient for them to return to the classroom. Only in the age 18-24 category did more respondents indicate that pay alone, as opposed to more than pay, would bring them back to the classroom. Nonetheless, 31 percent of all those surveyed indicated that a pay increase would be sufficient to convince them to return. © 2017 Oklahoma State Department of Education (OSDE). All rights reserved.